in the University of Paris. continuing the study of Philosophy, Theology, Poetry. 1980 - 90 Dancer and choreographic assistant of Jerome Andrews in Paris. Performances in Paris - Dijon - New York. 1982 Actor in Rosa, a film by Christophe Christophis. 1985 Palimpsest, a choreography for the festival “Hivernales d’Avignon”. 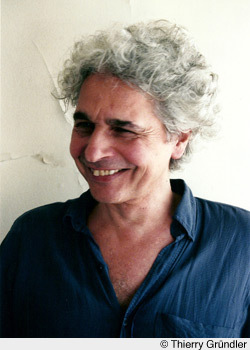 for the creation of "Tanzabend 1", 1993 and "Trauerspiel", 1994. Since 1981 Member of the Board of Directors of the Foundation Yannis Tsarouchis in Athens, Greece. Since 1984 Teacher of Pilates method and modern dance based on the work of Jerome Andrews. with Christine Kono, David Kern and the Ensemble for Intuitive Music Weimar. with Christine Kono, David Kern and Augusto Pavanel. 2002 - 03 The Seventh Day a film by Paolo Rudelli. with Christine Kono, Thomas McManus, Augusto Pavanel, Paolo Rudelli. 2007 L’altra svolta, a duet with Christine Kono, for the festival “Biarteca” in Rosazza, Italy. using the material from Forsythe’s piece, “Die Befragung der Robert Scott”. with Christine Kono, Thomas McManus, David Kern, Paolo Rudelli. with Christine Kono and Thomas McManus for “L’animal à l’esquena”, Cerlà, Spain. with Christine Kono, Stéphane Vernier, Liz Waterhouse, Paolo Rudelli. published for reviews or catalogs in Athens and Paris.